Linked from several mac blogs and news sites is the HyperCard episode of Simple Beep (Simple Beep is a podcast looking back at the history of Apple and the Mac community). Why Hypercard Was So F*****g Great – Uli Kuster on Vimeo which does just that. The Origin of HyperCard in the Breakdown of the Bicycle for the Mind — Medium which lead me to search Medium for HyperCard. The results indicate, I think HyperCard’s importance and will give me something to read for a good while. SuperCard is still being maintained and regularly updated. It is, I think, the software that is nearest to HyperCard in functionality and spirit. I use it several time a week. This reminds me that you can Run a Hypercard stack on a modern Mac (A quick test and I am excited again) and that I have a Color Classic that I should boot up sometime. 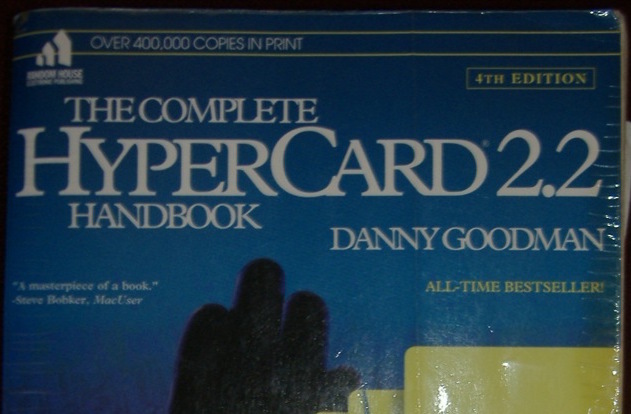 The featured Image of this post is one of my, many times read, HyperCard Handbook.